*The photo is an example of a system. Memory Card Camera Recorder "P2 Cam"
This P2 cam combines high cost-performance, easy operation and expandable functions to meet needs in a wide range of uses, from image production to broadcasting. A 2/3-type shoulder-type model, it accommodates a variety of interchangeable lenses. And its compact body provides superb mobility with approximately 2.8 kg (6.2 lb) for the main unit. Its MOS sensor attains high F12 sensitivity (at 59.94 Hz) and low noise with an S/N of 59 dB (standard). Multi HD/SD codecs, including AVC-Intra100/50, are equipped. In addition to these basic specifications, a wide range of functions are available as options, such as networking functions, uplink device support, and a Variable Frame Rate (VFR). This enables low-cost system support for numerous and diverse applications. The AG-HPX610PJH/EJH/PJF/EJF also supports new P2HD technologies such as microP2 cards to enhance the high-speed data transfer, reliability and security. Low-rate proxy files (Quick Time/H.264)*1 with high resolution and superb sound quality are supported. This allows a PC, a Mac, a tablet, or a smartphone*2 to be used for previewing, metadata input, network transfers and even simple editing,*3 for a cloud-based workflow that maximizes IT potential. With this option, the AG-HPX610TH/610TF records proxy files onto SD/SDHC memory cards or onto P2 cards. *1 It supports high-quality video (Quick Time/H.264) and audio formats at a low bit rate. High-quality proxy files can be used for breaking news and other scenarios that would benefit from proxy workflows. Moreover, it streamlines the production workflow by allowing the editor to review the content details during offline editing. These options enable use of a wireless or wired (Ethernet) LAN. Proxy files*4 can be streamed or viewed via a standard web browser on a PC/ Mac, tablet, or smartphone. *2 While viewing the streamed files, metadata can be added to the P2 files. Using a PC/Mac also enables a cloud-based workflow by uploading and sharing video data via a network. The AG-HPX610PJH/EJH/PJF/EJF and a device, such as a PC, a Mac, or a tablet, connected to a wired or wireless network can be used for playlist editing. 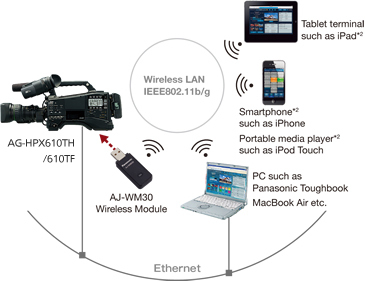 This greatly increases the efficiency and speed of your workflow by making it possible to handle preliminary editing with only the camera and connected device, and then transfer the data*6 wherever it is needed. 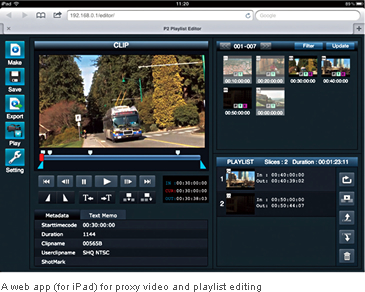 Playlist editing and saving, playlist viewing and SDI output, as well as editing and copying can all be done by web apps. Portable uplink solutions are supported. 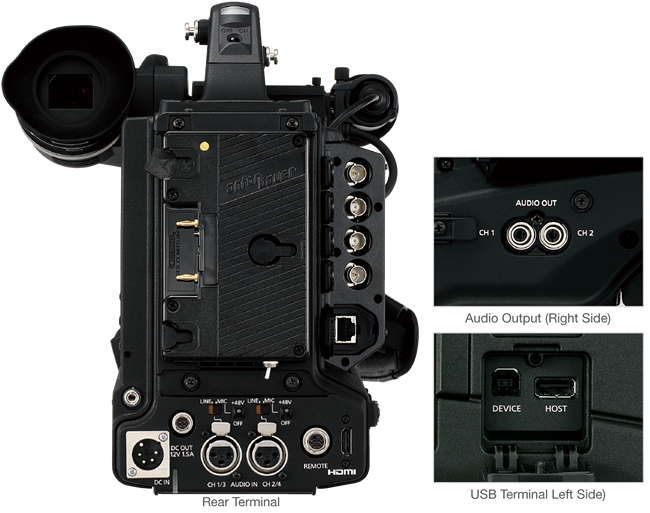 The status, settings, and bandwidth condition for the LiveU LU40 Series*7 can be displayed on the camera viewfinder, and uplink start/stop can be operated. This allows the camera operator to handle live relays comfortably and securely. Support*8 is provided for video uplink systems using ordinary phone lines. The status, settings and bandwidth condition for the LiveU LU40 Series*7 can be displayed on the camera viewfinder, and uplink start/stop can be operated by camera-operator without taking eye away from VF. This allows the camera operator to handle live relays comfortably an d securely. 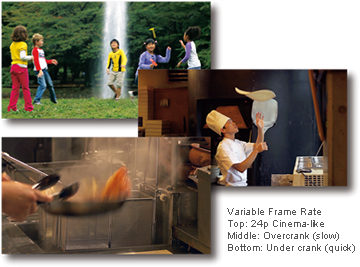 Quick/slow-motion recording is provided by the use of a variable frame rate (frame dropping/high-speed shooting). Recording modes of 24p/30p/over 60p can be simultaneously selected, with 24 PsF output from SDI OUT to meet diverse image production needs. In 720p mode, the frame rate can be set in the range of 1 fps - 60 fps, and in 1080p mode it can be set to 1 fps - 30 fps. This allows the use of undercranking and overcranking to create fast-motion and slow-motion effects. Either 24p/30p Native mode or over 60p mode can be selected for recording. In addition, the 24PsF format can be output from SDI OUT for uncompressed data recording. *1: Proxy data cannot be recorded when using the Loop Rec or Interval Rec function. Proxy data is low-resolution video and audio data with time code, metadata, and other management data in a file format. The use of DCF Technologies is under license from Multi-Format, Inc.
*2: For the latest information, see "Service and Support". *3: The supported functions vary depending on the optional configuration. *4: The optional AG-YDX600G Video Encoder Board is required to use proxy video. *5: In addition to the AG-SFU604G Upgrade Software Key, the AG-YDX600G Video Encoder Board and AG-SFU601G Upgrade Software Key are required for operation. For a wireless LAN connection, the AJ-WM30 Wireless Module is also required. *6: There is no data transfer function in the camera itself. *7: The LiveU LU40 Series is not included in the option. Visit the LiveU web site. *8: The camera software must be updated. 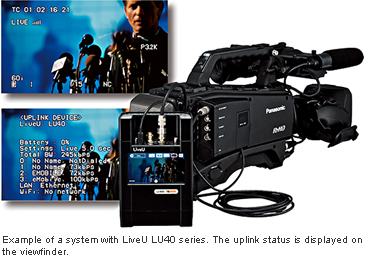 The LiveU LU40 Series is not included in the option. A BNC cable and USB cable are required to connect the camera to the LU40 Series. 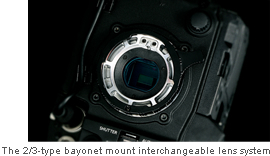 For mounting to the camera, a separately purchased mount adapter (manufactured by a different company) is required. For information on LiveU and other application solutions, see "Service and Support". The high-sensitivity MOS sensor and AVC-Intra codec enable high-quality, Full-HD 10 bit 4:2:2* recording. * Using the AVC-Intra100 codec. The 2/3-type bayonet mount interchangeable lens system lets you choose from a variety of 2/3-type zoom lenses for broadcasting and other professional uses from third-party manufacturers. Select the lens type and performance level that meet your needs. The 2/3-type MOS sensor allows you to select two modes: the NORMAL mode offering ultra low noise, and the LOW LIGHT mode offering high sensitivity levels of F12 at 59.94 Hz (F13 at 50 Hz). CAC (Chromatic Aberration Compensation): When using a CAC compatible lens, the small amount of circumjacent chromatic aberration (circumjacent blur) that is not corrected by the lens is compensated by this process. DRS (Dynamic Range Stretch)*: Suppresses blocked shadows and blown highlights to achieve a visually wide dynamic range. *The DRS function does not operate in 1080/25p, 1080/24p or 1080/30p mode. Advanced Flash Band Compensation (FBC): High-precision flash band detection and compensation. Gamma: Select from 7 mode (HD NORM/LOW/SD NORM/HIGH/B. PRESS/CINE-LIKE D/CINE-LIKE V) gamma curves. Digital image settings: H Detail, V Detail, Detail Coring, Skin Tone Detail, Chroma Level, Chroma Phase, Color Temperature, Master Pedestal, Knee (LOW/MID/HIGH), Matrix (NORM1/NORM2/FLUO/CINE-LIKE). Scan Reverse function for use with a cinema lens adapter. Digital Zoom function for 2x and 4x close-ups. Variable Shutter Speed from 1/12 sec to 1/2000 sec plus Synchro Scan function. Four-position (CLEAR, 1/4 ND, 1/16 ND, 1/64 ND) optical neutral density filter wheel. This advanced system maintains intra-frame compression based on the new MPEG-4 AVC/H.264 moving picture compression technology. It records in AVC-Intra100 mode (1920 x 1080,* 10 bit, 4:2:2) for images with full-pixel HD and full sampling, and AVC-Intra50 mode (1440 x 1080,* 10 bit, 4:2:0) for high-quality images at a low bit rate and for low-cost operation. * These figures are for 1080i/p mode. The AG-HPX610PJH/EJH/PJF/EJF also supports 720p mode. The AG-HPX610PJH/EJH/PJF/EJF can record full 48 kHz/16 bit digital audio on all four channels. You can freely select the audio source for each channel, choosing from mic-in, line-in and wireless receiver. Reliable for broadcast-use: Offers high reliability to withstand impacts, vibrations and temperature changes. Quick start: Lets you stand by with the power off, then start shooting immediately with no need for cueing. Safety: Automatically records onto blank card sections and protects against accidental data overwriting. Re-use: High durability and reliability allows years of repeated use. Instant playback: Files can be played or transferred as soon as the thumbnail images are displayed. * To use microP2 Card, the optional AJ-P2AD1G Memory Card Adapter is required. Double Slot system: Two P2 card slots allow continuous recording, card select (recording slot selection), and hot-swap recording (replacing a card during recording). One-Clip rec mode: Records up to 99 consecutive cuts as a single clip. Loop rec:*1 Repeatedly re-records while maintaining a recording of the most recent, predetermined period. Pre-rec:*1 Continuously stores footage prior to pressing Rec Start for recovery if desired. Interval rec:*1 Automatically records intermittently based on a set interval and recording time. 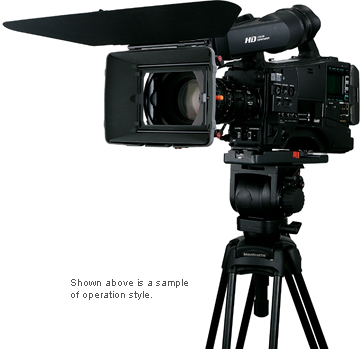 One-shot rec:*1 A frame-shot recording function useful for producing animations. Text Memo:*2 Up to 100 memos can be posted onto a clip as bookmarks. Shot Marker:*2 Used to mark clips as OK, NG, etc. Metadata: Data with information such as operator's name, shooting location, and text memos can be added via an SD Memory Card. *1: These functions cannot be used during optional Variable Frame Rate recording. *2: Shot marker and text memo cannot be used in loop rec, interval rec, or one-shot rec. Comfortable operating functions, such as SmartUI, and a host of system functions are included in this compact, lightweight (approximately 2.8 kg [6.2 lb]) body. The AG-HPX610PJH/EJH/PJF/EJF is approximately 2.8 kg (6.2 lb) for the main unit. This compact body provides superb mobility. It is also designed with excellent forward visibility. Power consumption for the main unit is only 18 W. This is a reduction of about 50% from our previous model, the AJ-HPX2000/2100 (36 W for the main unit only, with LCD off), which was released in 2007. The AG-HPX610PJH/EJH/PJF/EJF consumes only 22 W even with the optional AG-YDX600G Video Encoder Board and optional AG-YA600G HD/SD SDI Input Board mounted. This user interface consists of an LCD and a variety of switches. A large number of functions, including Scene File settings, Audio Level settings, Audio IN/OUT selection, Time Code settings and MON/HDMI Output Video settings, are easy to recognize and can be set with only a few steps each. Focus Assist: Press the Focus Assist button to expand the center section of the viewfinder screen for easier focusing. Scene Files: Select either of six preset files from the menu according to the shooting situation. The settings can also be stored onto an SD card. Gain: There is a three-position gain selector with a maximum gain value of +18 dB. User Buttons: Functions can be freely allocated to the three User buttons. Shockless White Balance: A smooth transition occurs when switching White Balance modes. This is effective, for example, when moving from outdoors to indoors. 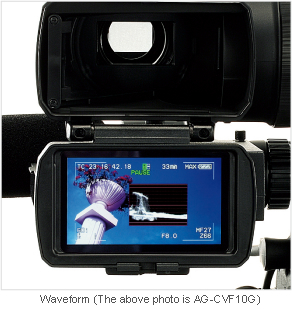 WFM: Simplified waveform and vectorscope display. Zebra: Select any two levels from among 50% to 109%, in 1% steps. Mode check: Displays a list of the camera settings. Y-GET: Measures brightness at center and displays numerical data. Auto White Balance with an auto tracking white function. User files can be saved to an SD card and shared with other cameras. Audio input level adjustment (front) can be switched on/off and allocated to desired channels. The optional AG-CVF10G Color HD Viewfinder (cost-effective model) and AG-CVF15G Color HD Viewfinder (upper grade model) are 8.76 cm (3-1/2 inches) color LCD with approximately 920,000 dot resolution and a 16:9 aspect ratio. When opened, it serves as an LCD monitor. 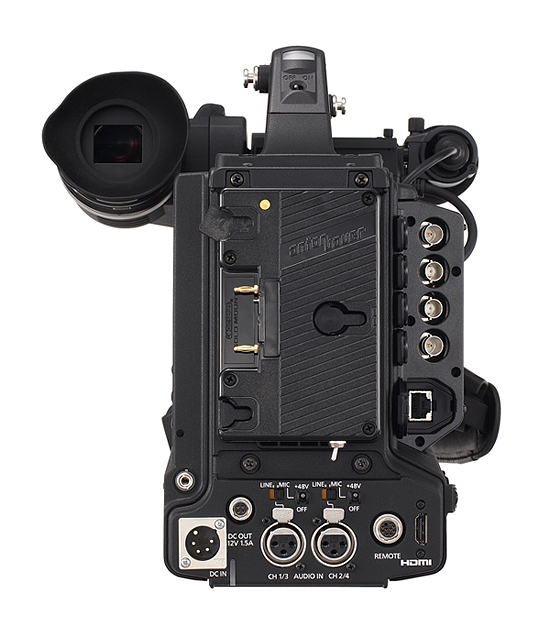 The optional 5.08 cm (2 inches) AJ-HVF21KG Monochrome HD Viewfinder can also be used. Camera Studio System: The optional camera extension system (AG-CA300G Camera Adapter and AG-BS300 Base Station) support low-cost studio integration. * Only functions that are supported by the AG-HPX610PJH/EJH/PJF/EJF can be controlled. SDI OUT (IN): It outputs SDI with embedded audio. 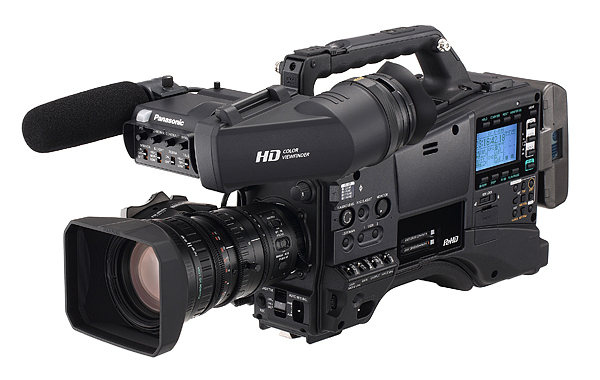 Backup recording operation can be interlinked with the Rec Start/Stop controls of an SDI input-equipped Panasonic recorder, such as the AG-HPD24. Adding the optional AG-YA600G HD/SD SDI Input Board makes it possible to switch SDI input with this terminal, for line recording. HDMI OUT: This terminal allows digital A/V output to a wide range of devices with both professional and consumer specifications. MON OUT: This terminal outputs separate from the SDI OUT terminal. 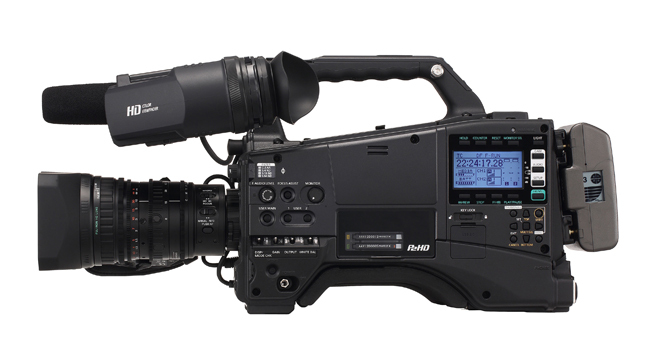 It can also be set to output HD SDI, down-converted SD SDI, or VBS. Aspect conversion: The aspect ratio can be selected to Side Crop, Letter Box, or Squeeze mode when down-converting and outputting from SDI OUT/MON OUT terminals. 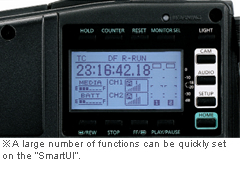 TC IN/OUT: A built-in SMPTE time code generator/reader. IN/OUT selectable by menu settings. GENLOCK IN: For synchronized recording with a multi-camera system. USB 2.0*1: Equipped with both HOST (for connection to an HDD) and DEVICE (for connection to a PC/Mac) terminals. UniSlot®*2 compatible wireless receiver slot (2 channels). XLR audio input: 2 channel mic/line inputs supporting 48V phantom power supply. Audio output terminals (pin jacks), 2 channels. Multiple battery support, including Anton Bauer. *1: When the 64GB microP2 card is used, the copy at only the clip unit is possible. *2: UniSlot® is a trademark of Ikegami Tsusinki Co., Ltd.